Audiences of all ages will be captivated by Lightwire Theater’s dazzling visuals and unique menagerie of characters that magically appear out of the darkness. Combining the arts of puppetry, theater and dance with the music of timeless holiday hits, this magical and captivating tale of family, friendship and hope creates a truly one-of-a-kind, inspired and exhilarating holiday experience that will be a treasured memory for years to come. 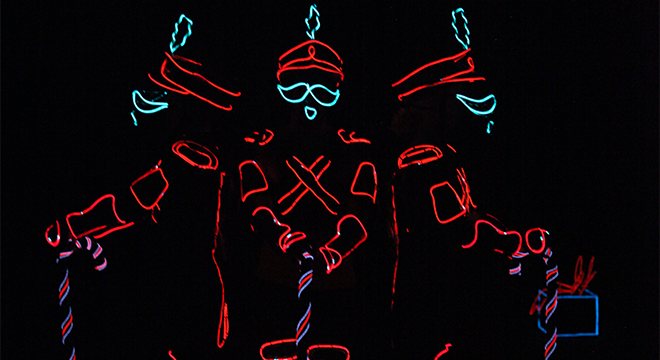 Since bursting to national acclaim after appearing as semi-finalists on America’s Got Talent and winning the top honors on TRU TV’s Fake Off, Lightwire Theater has gone on to enthrall audiences worldwide with their unique combination of skill and grace as told through the technological innovations of moving light characters.